I can’t believe how yummy this is….I saw a recipe on Ella’s app of a kale salad where she massages the raw kale leaves with the dressing until soft and then adds toppings to the salad. It sounded weird…I have been juicing kale and making kale chips, but I have never thought of eating raw kale because the leaves are so thick and hard. 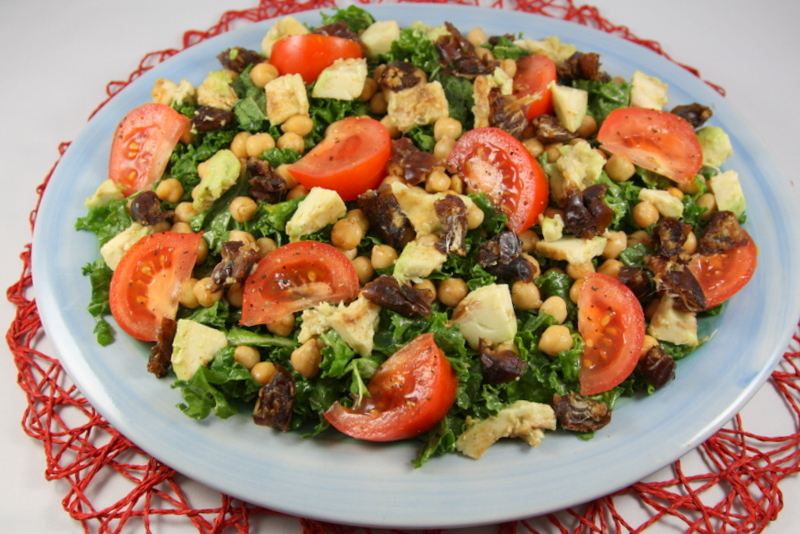 I then started searching the net for kale salad recipes and was inspired to try my own concoction – and it is fabulous! Wash and dry kale. Tear leaves into bite sized pieces and remove hard central stem. place kale into a large bowl. Mix all salad dressing ingredients together and taste. 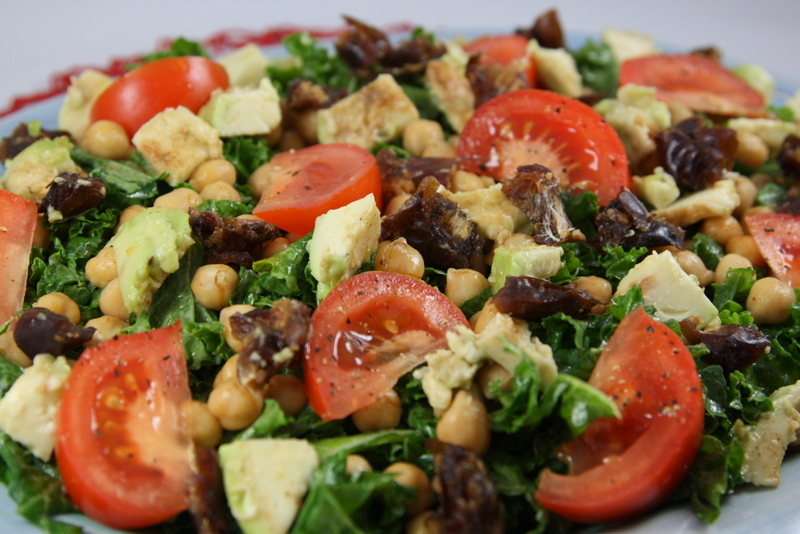 If it suits your taste, drizzle it over the kale leaves and massage the dressing through the leaves. Keep massaging like this for about 2-5 minutes – the leaves will become soft and the bunch will reduce in size. Place leaves onto a serving plate. Sprinkle the chickpeas with your favourite spicy salt until they are nice and salty. Chop up your tomato and season it with some black pepper. Chop the dates into small pieces. Slice the avo into small chunks and season with pepper/salt. 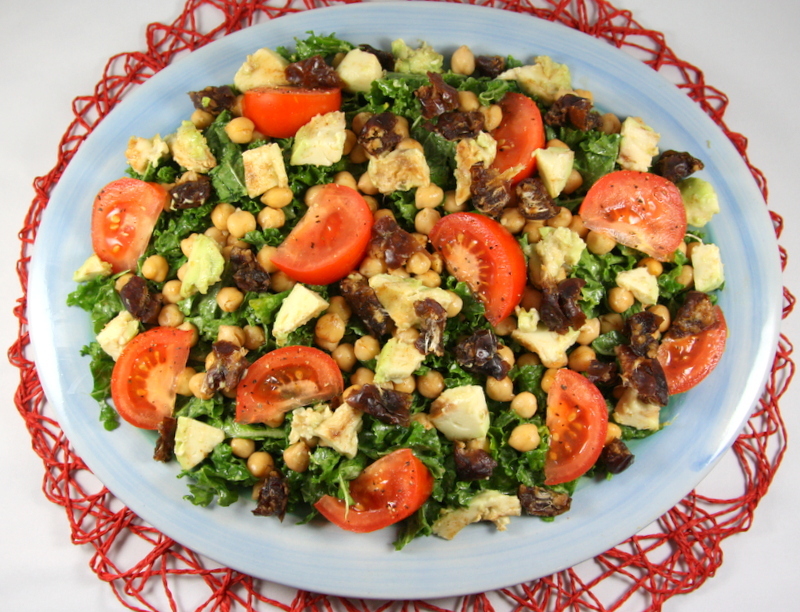 Scatter the avo, dates, chickpeas, nuts and tomato pieces over the leaves and enjoy! What is your favourite kale recipe?